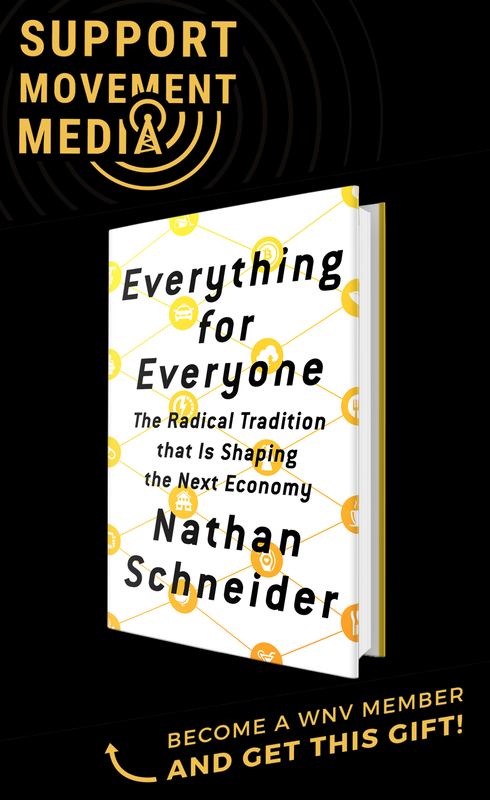 After a series of disruptive actions aimed at Spectra Energy, its investors and political supporters, organizers know that the fight is far from over. Of course, that was the point. The action in Waltham was part of the Week of Respect and Resistance, a series of demonstrations, sit-ins, and lock-downs aimed at Spectra Energy, their investors, and the politicians who support them in their plan to expand a fracked gas pipeline — the so-called Algonquin, a name which many activists describe as insulting to the indigenous speakers of the Algonquian language — through New England. With FERC poised to present its final Environmental Impact Statement any day, and with New England politicians and Big Greens voicing their unwavering support for their favorite “bridge fuel,” climate justice organizers and pipeline fighters in New York, Connecticut, Massachusetts, and Rhode Island knew they had to escalate their already long-running campaign against Spectra. During the week of December 13-19, activists brought that tenaciousness and fearlessness to a variety targets, from Danbury, Conn., where Spectra plans to expand the already-existing gas pipeline to accommodate the higher volume of gas flowing from the Marcellus Shale, to the gas compressor station in Cromwell, Conn., to the offices of some of the most powerful individuals and entities involved in the so-called Algonquin Incremental Market project — including Spectra themselves. This emphasis on engagement and creativity was crucial to one of the goals for the week: to not only disrupt business as usual at the locations of the protests, but to disrupt the narrative about fracked gas perpetuated by the energy industry, fossil fuel-friendly politicians, and mainstream environmental groups alike. In addition to blocking the driveway to the Cromwell gas compressor station, Dan Fischer explained, he and fellow Capitalism vs the Climate member Vic Lancia “were also trying to block the formation of misleading assumptions. People drive by the compressor station every day, and either don’t know about it or falsely assume it’s part of the clean energy process. So we felt it was important to take direct action at the point of assumption and say this is a dirty fuel, and there are plenty of clean, renewable alternatives that make fracking unnecessary.” To help make this point, Fischer and Lancia locked themselves to a massive wooden “bridge to nowhere” built in the days leading up to the action. Members of Flood Boston and other groups fighting pipeline expansion in Massachusetts echoed this sentiment at their action at the Boston office of the State Street Corporation, one of Spectra’s biggest financial backers, later in the week. For Heyman, the action was an opportunity to use art, theater and music to “dismantle the myths surrounding natural gas” and advocate for community-controlled renewables. To this end, activists constructed a giant pair of lips “spewing myths” about fracked gas which protesters challenged with facts about the health and safety impacts of the pipeline project. “The people of West Roxbury are traumatized,” said David Ludlow, a 72 year-old organizer in the Boston area, citing the 2010 explosion of a gas pipeline in San Bruno, Calif., which killed eight people and which looms large in the minds of local residents bracing themselves for the construction of the West Roxbury Lateral pipeline and a new, high-pressure Metering and Regulating Station, both of which would be built dangerously close to an active quarry and residential areas. Activists and community members expressed these concerns in songs, chants and cantastorias that rang out in State Street’s office and continued to Boston’s South Station after protesters delivered a letter urging State Street to divest from Spectra Energy and other similarly destructive corporations, including Kinder Morgan, whose gas pipeline projects also threaten Massachusetts communities and ecosystems. 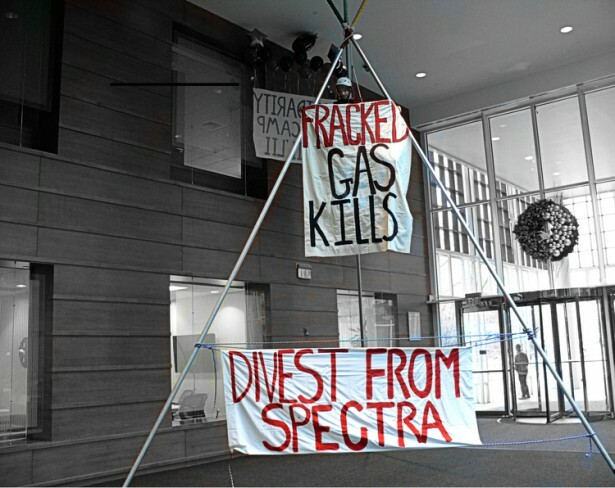 In Rhode Island, activists drew attention to the hypocrisy of the politicians and government agencies supporting Spectra’s plan, with Burrillville Against Spectra Expansion holding a protest at the Rhode Island Department of Environmental Management and FANG organizing a sit-in at Sen. Sheldon Whitehouse’s office. Ten protesters joined University of Rhode Island physics professor Peter Nightingale, a member of Fossil Free Rhode Island, in the sit-in, and cheered for Nightingale as he was eventually arrested for refusing to leave the office. Whitehouse, who Nightingale calls a “wolf in sheep’s clothing,” has long been a focal point in the Rhode Island fight against Spectra’s pipeline projects: in August, members of Burrillville Against Spectra Expansion held a sit-in at Whitehouse’s office which led to a meeting with the senator. The actions during the Week of Respect and Resistance garnered significant local media attention and, some speculate, may have played a role in FERC delaying the release of their final Environmental Impact Statement on the AIM project — not to mention Spectra’s stock hitting a 52-week low. Still, organizers know that the fight against Spectra — and the fight for climate justice — is far from over. However, even as the resistance to Spectra and the fossil fuel energy industry mounts, many organizers also recognize that there is still significant work that needs to be done within the environmental movement itself, a fact that was highlighted by the Week of Respect and Resistance coinciding with an escalation of the Black Lives Matter movement following the non-indictment of the police officers responsible for the choking death of Eric Garner. Andre explained that as FANG shared Black Lives Matter memes and articles on their social media platforms, “there was a lot of backlash from environmental organizers who follow the FANG page and who wanted us just to focus on pipelines. But life is not just about pipelines. Our struggles are not siloed.” Indeed, FANG members underscored this point by blocking a commuter train carrying passengers to a New England Patriots game for four and half minutes earlier this month to signify the four and a half hours Mike Brown’s dead body remained in the streets of Ferguson after he was shot by officer Darren Wilson. For all the work that needs to be done to stop Spectra and combat the oppressive tendencies within the environmental movement, the activists involved in the Week of Respect and Resistance all agree that the week of action marked a turning point in their campaign against Spectra. As Katkevich reflected on the week’s impacts, his mind turns to one of the other great passions of his life besides organizing: basketball. Anthony Sorge is a Connecticut-based educator, writer and activist. awareness, it is achieving even more popularity in the west with people’s increased interest in spirituality and ancient arts. are emotional creatures but it is true. Is it OK to have a happy place?